I was sad to read this morning that George Whitman had died, but as he was 98 and appeared to have lived the life he wanted almost to the end, I think my sad feelings were more out of concern for the end of an era than the death of a man I had not met. 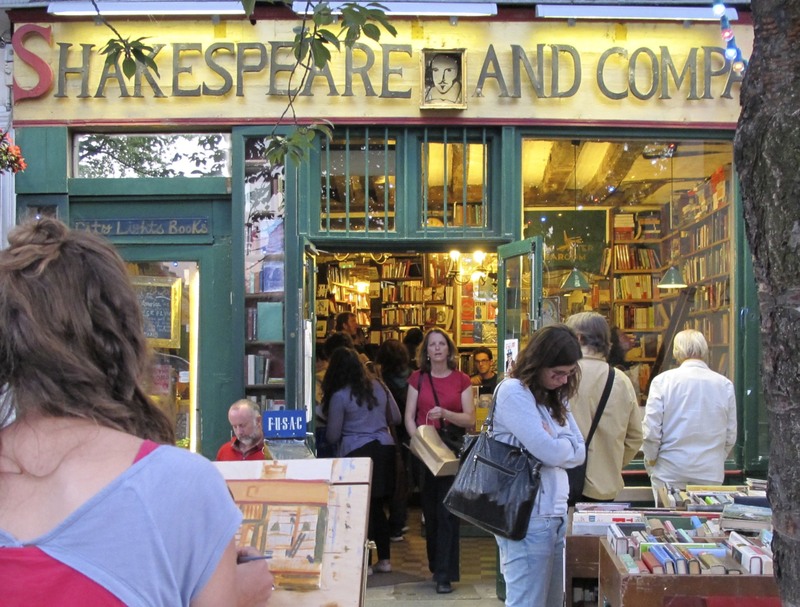 His only child, Sylvia Beach Whitman has been managing the famous bookstore for some time and I imagine it will continue to be a haven for those who wish to pop in to an English-speaking bookstore while in Paris. I’ve been fortunate to visit Paris four times, the first of which was when I was 19 in late December 1979. 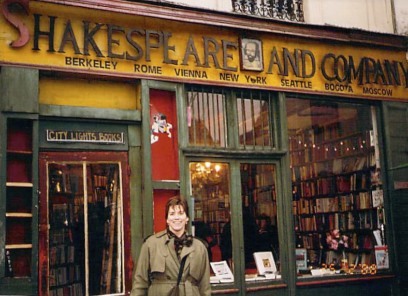 I remember being focused on seeing the Louvre and Notre-Dame and excited to be in Paris for New Year’s Eve, but I don’t remember stopping by Shakespeare And Company at that time. 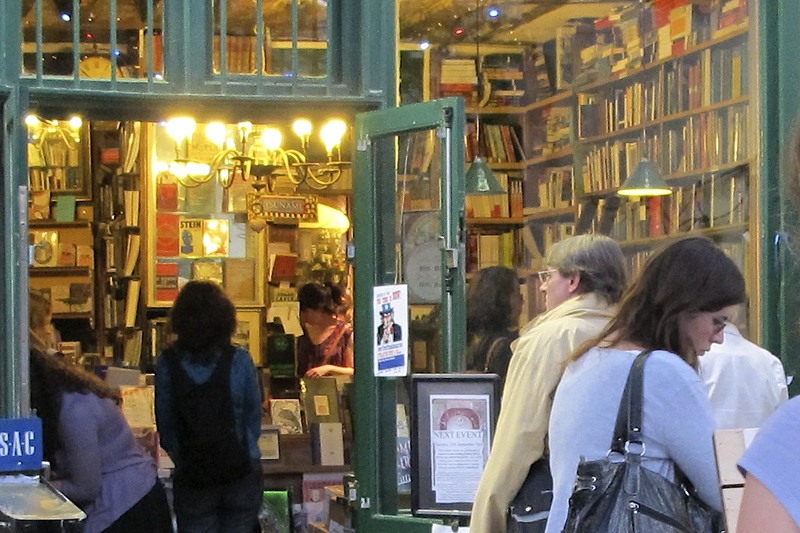 Ten years later I went back to Paris with my then 12 year-old daughter, Miranda for the millennium New Year celebration and made time to visit the bookstore and have the wet looking photo below taken while I was there. 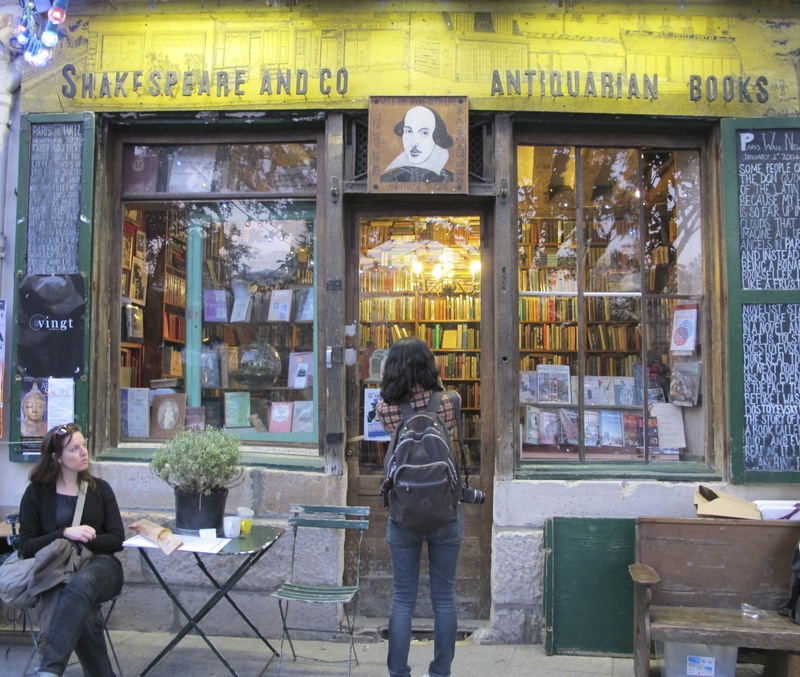 There’s generally a lot of activity both inside and out of Shakespeare And Company and the photo above gives you a glimpse of what I’m talking about. I always love sneaking a peek over the shoulders of artists who stop to paint and over to the left you can see another part of the bookstore which deals with antiquarian books. 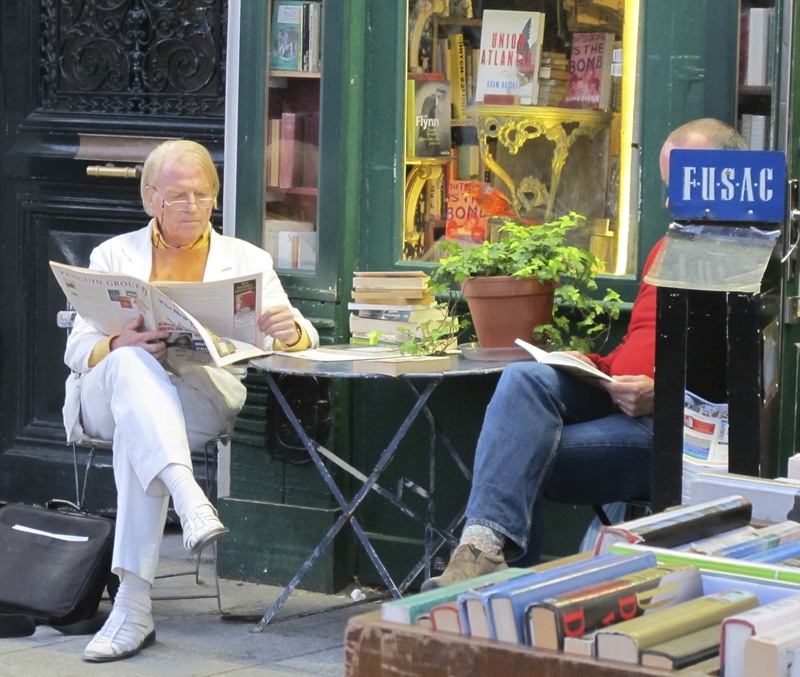 Notice the man dressed in white … I thought he looked a bit like author, Tom Wolfe. 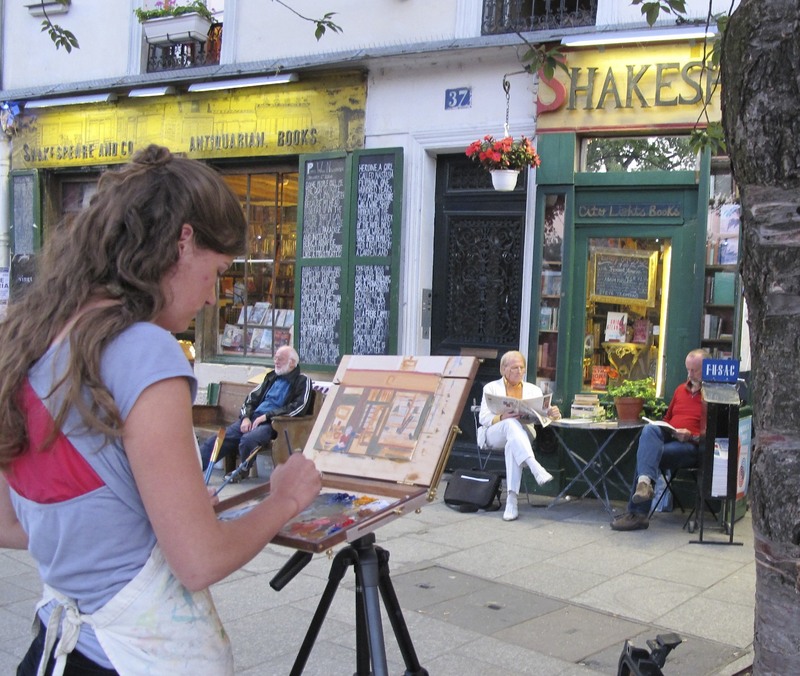 Speaking of artists, that’s my talented sister Margaret coming though the door having just made a purchase. I always look for something special when I’m there. 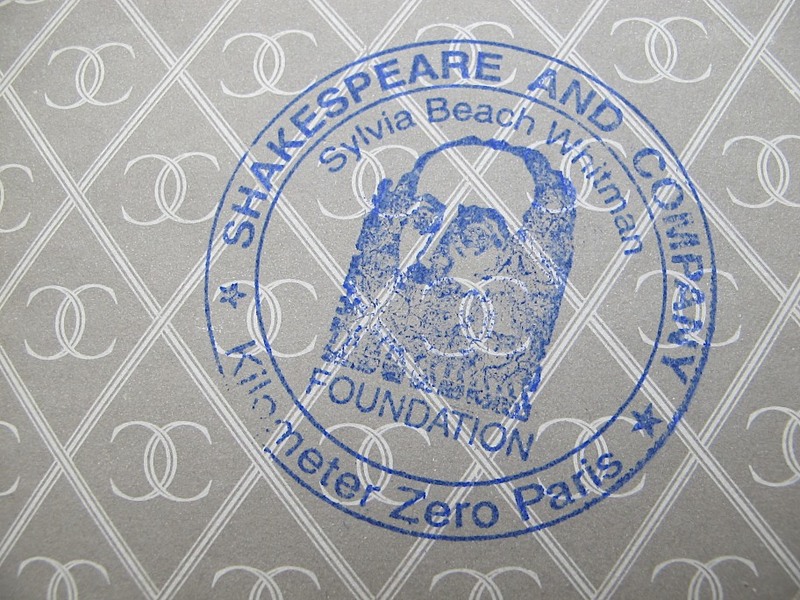 I particularly like the stamp you can get when you buy a book. There’s an inscription I can’t read in my book and I thought maybe one of my French-speaking friends could help out with a translation. 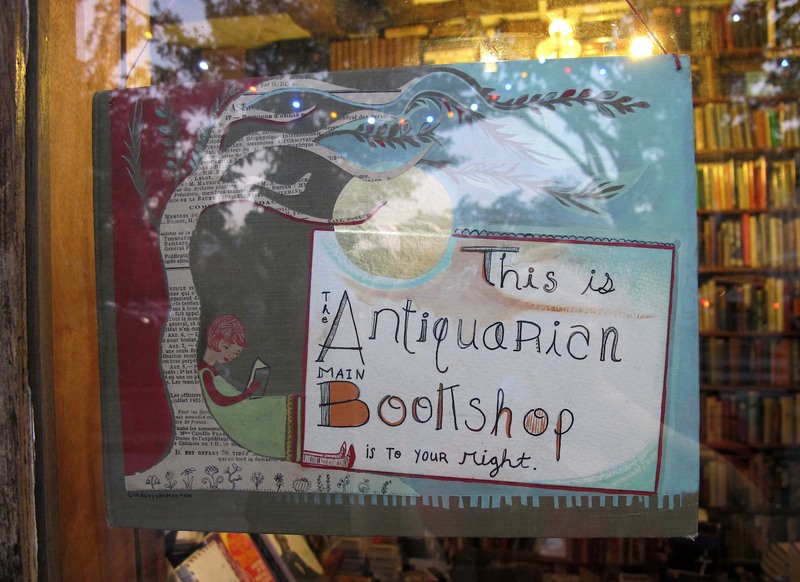 The bookstore is full of quirky places that I did not photograph, but this blogger has some great interior shots. 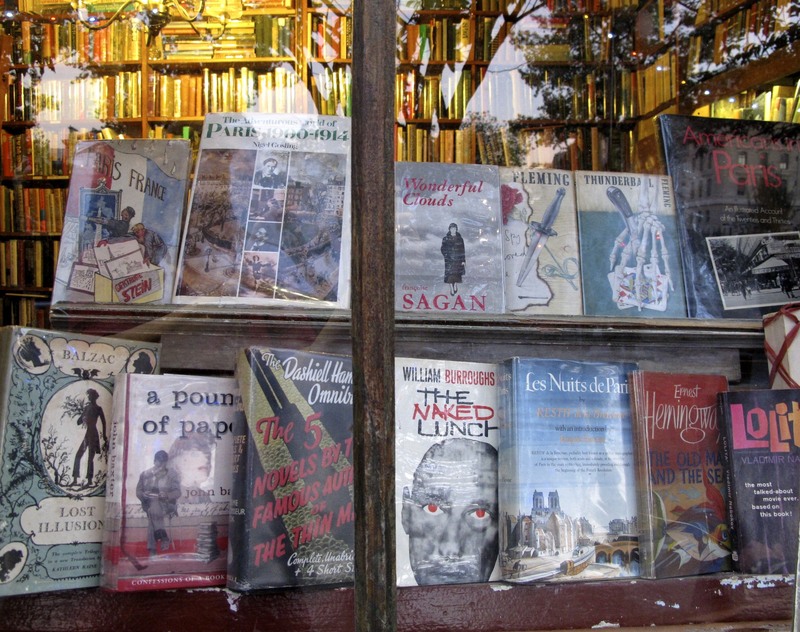 Ahhh … the side with the books I covet, but can’t afford. Thanks to my Paris based friend, Kim who alerted me to the death of George Whitman on Facebook with a link to this great NYTimes article on his life and passing. This entry was posted in Adventure, Bloggers, Books, Expat, Memories, Photography, Travel, Writing and tagged Elizabeth Harper, George Whitman, Gifts Of The Journey, Millennium New Year, New York Times, Paris, Shakespeare And Company, Sylvia Beach Whitman, Sylvia Beach Whitman Foundation. Bookmark the permalink. 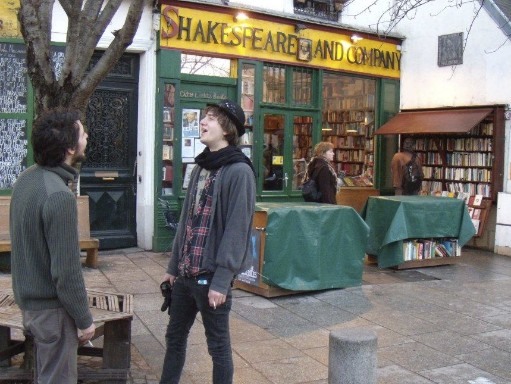 Now you’ve made my desire to visit Paris again even stronger. I knew I should have taken a few days after Slovakia. Another time, i guess. I have to wander through this fabulous store. Very roughly translated it says: “Hoping this helps to make you a top graduate. 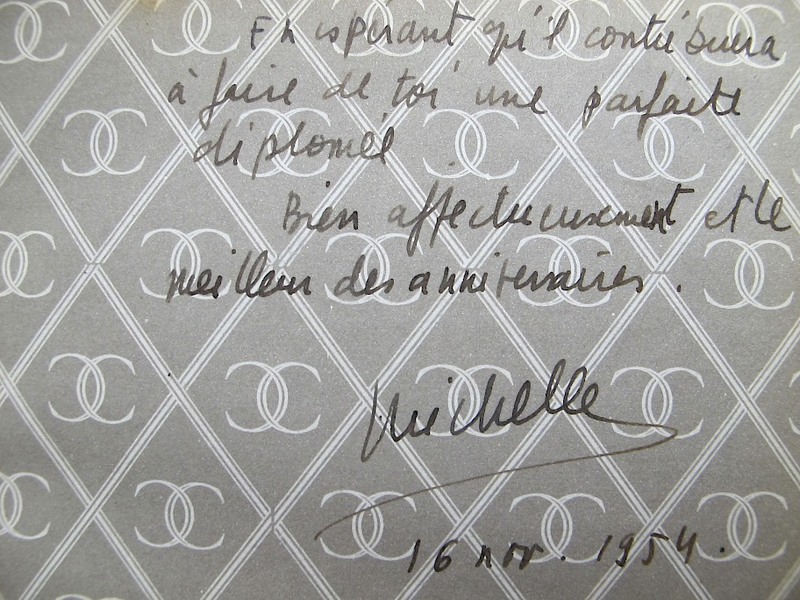 With fond best wishes, Michelle.” The real French speakers wil now shout me down! But that’s the gist. What kind of book is it?? I love the Internet, but I could happily live without it before I could live without books.